Denomination : 3 Jin or 10 Huo (10 Ant nose type coins). Mint : This type was issued in the State of Chu rather late in the spade issuing period, probably after 350 BC, and certainly down ot about 250 BC and possibly even later into the Han Dynasty period. Reference : FD-289. H-3.470 variety. Size : 36.6 x 105.0 mm. Weight : 35.55 grams. Grade : VF with clear characters. 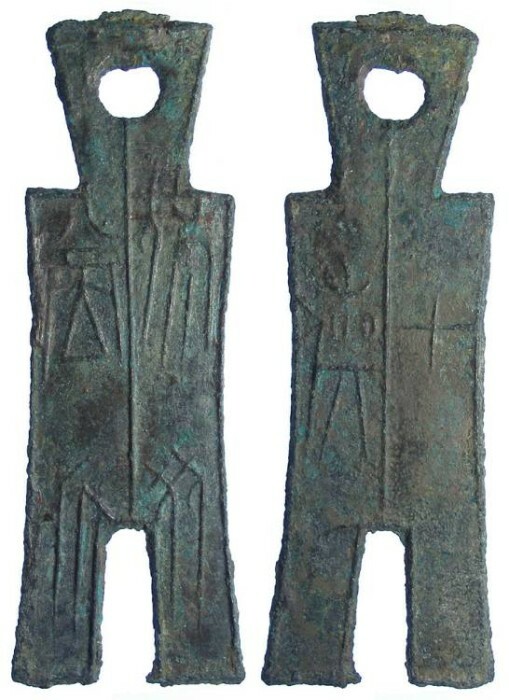 Obverse : The reading of the obverse characters is not fully understood, but is probably something like "SHU BU DANG JIN" meaning "special spade valued at a Jin, although the weight is more consistent with it being about 3 jin. Reverse : "SHI HUO" meaning "ten huo" with "huo" probably meaning an ant nose type coin.